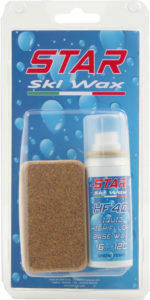 An innovative liquid formula for this new line of high fluorinated base waxes which guarantees such exceptional performance that it is used by professional ski men in world cup racing. For shorter distances the liquid wax can be applied by using a cork, while for the longer distances waxing iron application is recommended. Thanks to the new formula, it is no longer necessary to scrape after waxing, but just brush after cooling. 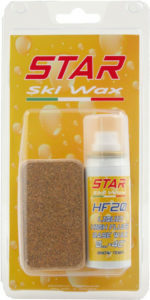 For best results, these bases can be covered with 100% fluoro products, just as any other solid base wax from the complete line proposed by STAR.